Saturday 12th of March and the conditions were great for a fish at the Docklands. 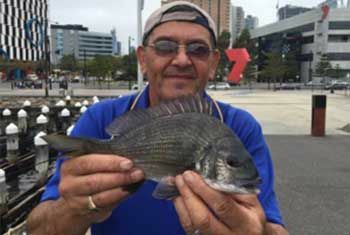 John Regali and the unidentified urban angler fished the Docklands for several hours. With the Pies and Doggies battling it out right behind them the guys had a productive session catching many small Bream, several Trevally and surprisingly a couple of Garfish. They were caught using several techniques but the most common technique was live maggots or pilchard strips on a float. All catches were released to fight another day. Well done John keep the reports coming.